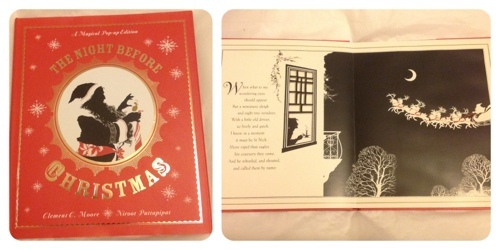 I wanted to share some of the Christmas story books that we've been sent by Walker Books. 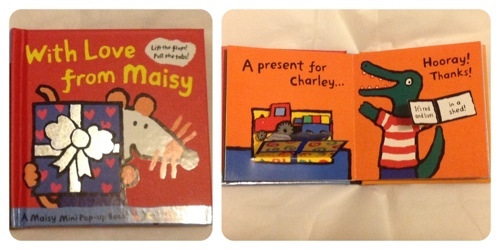 With Love, From Maisy is a fantastic pocket book which would be ideal as a stocker filler for toddlers. With simple text and 'lift-the-flaps' on each page, it's a handy book to fit into a stocker and then keep in a handbag or for in the car. We love this book! 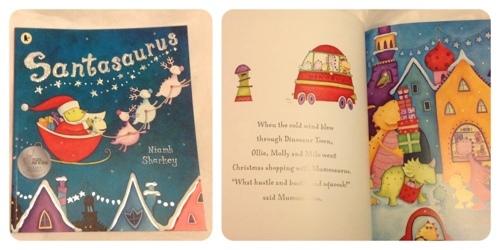 Santasaurus is a fabulous take on the popular theme of 'child who wants to see Father Christmas' featuring three young, sibling, dinosaurs Ollie, Molly and Milo. They write letters to 'Santasaurus' telling him what they'd like on Christmas Day, but will Milo get his wish to help Santasaurus? Beautifully illustrated, humorous and a real delight to read; The Boy declared, "That was a lovely story Mummy, can we read it again?" 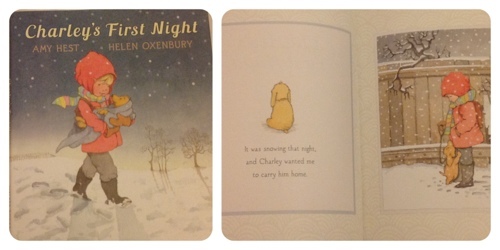 "On Charley's first night, Henry tells his new puppy "This is home, Charley". He says that a lot so that Charley will know that he is home. Henry's parents are pretty clear about who will be walking and feeding Charley (Henry will, and he can't wait). They are also pretty clear about where Charley will be sleeping – in the kitchen. But when the crying starts in the middle of the night, it looks like Henry's parents' idea about where Charley is going to sleep may have to change." Illustrated by Helen Oxenbury, Charley's First Night is a gorgeous book with a lovely and compassionate story woven through the pages, explaining how important it is to care for a pet and what they need. The Boy enjoyed the illustrations more than the story, but I suspect it's because he was minimal contextual understanding of having a pet. "It's Christmas time at the toy museum and all the toys hurry to the tree, but there aren't any presents! What can they give each other?" 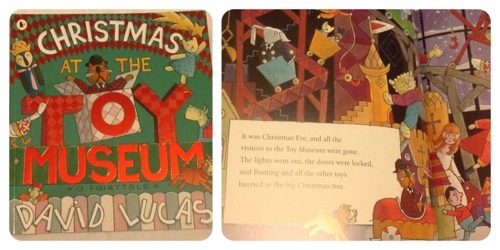 While not the style of book that we would normally choose (because of the illustrations), when we read Christmas at the Toy Museum this morning, The Boy really enjoyed it and it was a great story for discussion about giving and receiving presents. No home is complete without a Where's Wally? book and this Santa Spectacular version is the perfect gift to give this Christmas to all observant sorts! 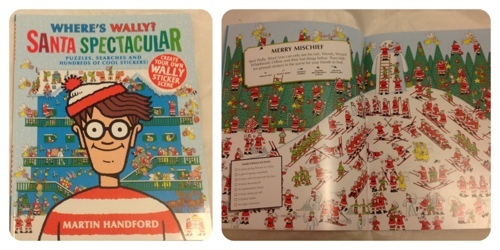 There are pages galore of festive puzzles, riddles, searches, trivia and games with over 300 stickers where the reader can create a merry Where's Wally? scene at the end too. The Boy is a little young for some aspects of this book (wordsearches and riddles) but he adores trying to see Wally and complete the sticker scenes. The Night Before Christmas is a 'must-read' for Christmas Eve and we already have a version that we tried to read last year. Admittedly The Boy was significantly younger and it's a tricky language for a (then) two year old to digest, but the images were boring as well and we didn't enjoy reading it with him. However, this version is truly magical! With simple black and white images on each page and cut-outs throughout the book, The Boy has been completely engaged reading this book and listening to the story. The text seems to be a little easier to read and explain, and the way that the story is illustrated really provides the non-reader with picture cues to comprehend the story. As with all interactive books, there is a fantastical end page and I shall go no more in explaining it, but my mum gasped when she turned the page. We were sent these books for the purpose of this review, our opinions are honest and unbiased. Santasauras – what a great name for a book! I'm sure that would go down very well in our house as the boys are loving dinosaurs at the moment. You've also just made me realise we need Wally in our house, another must have on my ever growing list.. so many books why can't I have them all! !